Democratic senators from a dozen states, from New Hampshire to Virginia, have asked for the same exemption that Florida got from proposed oil and gas leases, but Republican lawmakers support a bill to make it easier to explore for oil. The House Committee on Natural Resources recently approved sending H.R.3133, the Streamlining Environmental Approvals Act, to the full House. The bill, sponsored by Rep. Mike Johnson (R-La.) would weaken the landmark Marine Mammal Protection Act that protects marine mammals such as polar bears, sea lions and dolphins. “In the 45 years since it was enacted, it’s been used in ways that sometimes defy common sense,” Johnson said. Johnson represents Louisiana, one of the states whose coastline was befouled in 2010 by the largest oil spill in U.S. history. His bill would make it easier for oil companies to get government permits to survey for oil. The surveyors fire airguns,disturbing animals such as the endangered North Atlantic right whales, to create seismic images of what’s under the ocean floor. The Marine Mammal Protection Act, signed by former President Richard Nixon in 1972, generally forbids hunting, harassing, capturing or killing marine mammals in U.S. waters. 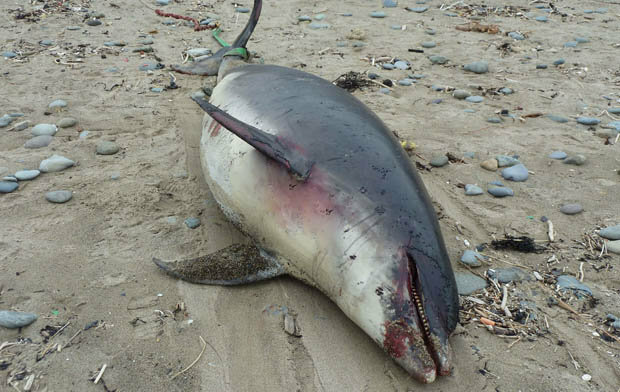 The law has helped reduce dolphin deaths associated with fishing for tuna, and some shipping lanes were adjusted to help protect the North Atlantic right whale. In January 2017, the Obama administration denied permits for six companies that wanted to use seismic testing to survey the Atlantic coast. That decision was based, in part, on harm the surveys would do to right whales, sea turtles and other marine life. Government estimates said up to 138,000 marine animals could be harmed. Under Trump, the National Marine Fisheries Service is weighing whether to let five drilling companies injure or disturb fish and marine mammals to search for oil and gas deposits in the Atlantic. More than 120 cities and towns on the East Coast oppose offshore drilling and/or seismic surveys. Florida Gov. Rick Scott, the Republican being cajoled by Trump to try for the Senate seat now held by Florida Democrat Bill Nelson, was able to get Florida removed from Trump’s proposed oil and gas lease sales. Lawmakers in more than a dozen other states want out too. Johnson supports Trump’s plan to allow drilling in most U.S. continental-shelf waters, including protected areas of the Arctic and the Atlantic. Oil and gas interests contributed $52,000, more than any other industry, to Johnson’s first congressional campaign in 2016. The oil and gas industry contributed more than $346,000 during that campaign to the other eight lawmakers who co-sponsored the bill, including three other representatives from Louisiana, Ralph Abraham, Garret Graves and Clay Higgins,according to the Center for Responsive Politics. In 2010, an explosion on the Deepwater Horizon oil platform killed 11 workers and led to the worst oil spill in U.S. history. Years later, bottlenose dolphins had high death rates and trouble reproducing. “When the Trump administration is talking, you can actually see the oil lobby’s lips moving,” said Rep. Jared Huffman (D-Calif.). Oceana, a nonprofit that works to protect the oceans, has put together a guide for how to get your city to pass a resolution opposing seismic surveys. Oceana can be reached at 202-833-2070. The Subcommittee on Energy and Mineral Resources has scheduled a hearing on the permitting process for seismic research at 9 a.m. Jan. 19 in Room 1324 Longworth House Office Building. A list of the members with links to their contact information is here. Call them and let them know your thoughts about whether protections for polar bears and whales should be weakened to increase oil company profits.